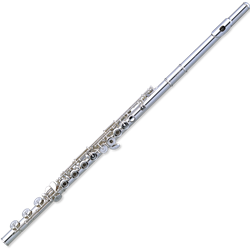 665RBE .925 Silver Headjoint, Silver plated Body, Footjoint and Mechanism, B-foot, off-set, E-mechanism The Quantz series embodies ingenuity, innovation and diversity, and is totally unique in the flute making industry. Aspiring flautists have never been so fortunate. Every Quantz model has French pointed arms. Once considered solely the domain of handmade flute, it is now universally provided by Pearl. Our patented Pinless mechanism and One-Piece Core-Bar construction are also present throughout the range. This ingenious yet simple design affords even the student or amateur flautist with an exceptionally efficient and dependable mechanism - another industry first.